Fill out our simple form and get quotes from local magicians. If you’re looking for entertainment for your event that brings something a little different to the table, will leave your guests amazed and offers a personal experience for everyone, then a magician could be the perfect solution. 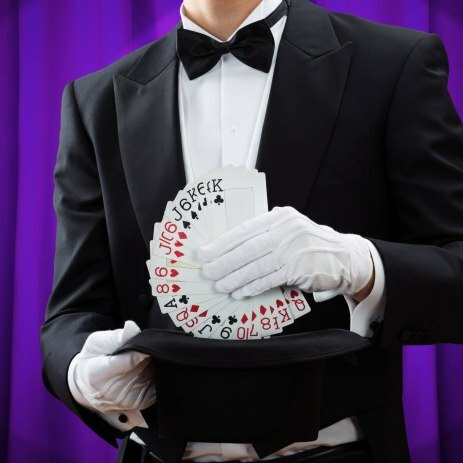 Add to Event’s collection of magicians for hire allow you to find a wedding magician or party magician to perform close up, table magic or even a stage performance. Professional entertainer for weddings, corporate events and private parties. Over 150 5 star reviews. Specialising in generating memorable events. The magician will walk around and perform wherever groups are gathered. Performed in front of an audience, often on a stage. The magician will walk around and perform at tables for smaller audiences. Magicians are cool again thanks to the recent wave of modern street magicians creating new and innovative tricks and bringing them to the people, close up. This could be one of the reasons close up table magic is often a popular choice for wedding receptions, dinners and all kinds of parties in fact. Party magicians can work their way around an event and mingle with guests, performing card tricks and other illusions keeping your guests entertained and astonished. To make it easy to find a magician near you that can provide exactly what you’re looking for, just submit a quote request form to receive free quotes from magicians for hire in your area.